The GameCube is succeeded by Wii, which can also play GameCube game disks and supports several GameCube controllers and accessories. 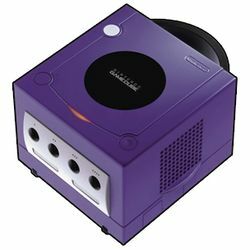 The Q Multimedia Console is a GameCube with the ability to play DVDs, audio CDs, MP3 CDs as well as several other features, but is only available in Japan. Pages in category "Nintendo GameCube"
This page was last edited on 19 October 2015, at 14:13. This page has been accessed 153,272 times.